If you suffer from chronic shoulder pain due to arthritis, bursitis, tendinitis or an old injury, or you’ve recently injured your rotator cuff or suffered a ligament or tendon sprain or tear, then you may benefit from physical therapy, traditional orthopedic care, non-surgical stem cell injections or even stem cell-enhanced surgery. Can stem cells heal shoulders? This was a controlled 10-year study of rotator cuff repair in which the doctors repaired rotator cuffs in 90 patients. One half of the patients received their own concentrated bone marrow in the shoulder while the other half did not. The patients who received their own concentrated bone marrow faired significantly better than those who did not. At six months the 100% of the patients who receive bone marrow were healed completely versus 67% in those who did not. 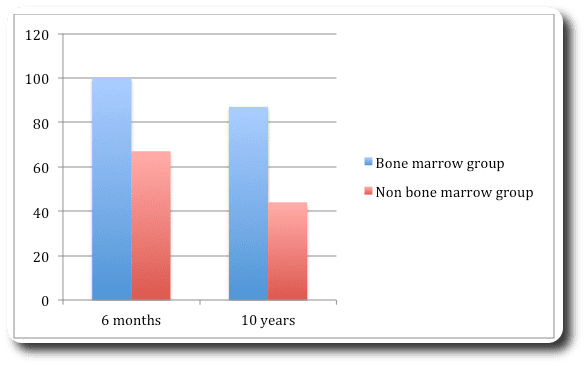 Among the bone marrow group the more cells that received more mesenchymal stem cells and other progenitor cells (quality of the bone marrow was better) had better and more complete repairs. Lastly, MRI imaging confirmed that the rotator cuffs of patients treated with stem cells were much thicker that those who did not receive any stem cells. At McKenna Orthopedics, we augment BMAC with a pliable *amniotic tissue allograft developed by Dr. McKenna. It is derived from human placental amnion, which functions as a biologic structural matrix to facilitate and enhance tissue healing and repair. This allograft contains 108 different growth factors including WNT-4 and prostaglandin. Prostaglandin inhibits inflammation, which occurs after injury and marks the beginning of the healing process. The faster we can tame this inflammation, the sooner the body can move on to the next phase of healing, regeneration. It’s important to note that our amniotic tissue product has more than 60 times the amount of prostaglandin compared to other products. WNT4 is arguably the single most important molecule required for wound healing. Our product has more than 10 times the amount of WNT4 as competing products. For more information about BMAC and amniotic tissue products at McKenna Orthopedics Click Here. Below are common shoulder conditions we treat at RMI. If your shoulder condition is not listed, please contact us to see if you are a candidate.